Tech4Good is a meetup group that connects people from all types of industries. Whether you are a non-profit organization, a funder, a programmer, an individual with a great idea, or a social changemaker, this meetup group will welcome you. As most good meetups do, members are encouraged to share, learn and collaborate. This month’s speaker, Justin Isaf, briefed folks about the benefits of managing communities. Justin currently manages 4 million comments a month for the Huffington Post Media Group, and has eight years of experience building highly leveraged online communities. – and…a URL to download an e-book version of Randy Farmer’s Building Web Reputation Systems. Justin also offered three tactical approaches to leveraging communities (Twitter, Forums, and Blogs) while giving insight into their strengths and weaknesses. Twitter, for example, can be used to build conversations between followers, but those kinds of communities will never grow as large as the more traditional Forums. Blogs, on the other hand, give Community Managers more control over their communities than the other two approaches. 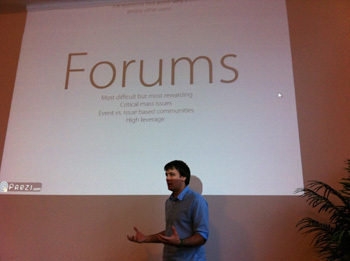 Justin also discussed the Pros and Cons of being a community manager. “You need to have thick skin to do this work,” he stated after describing an experience where one of his former community leaders started spreading rumors about him on the web. Communities can be very valuable if you are crystal clear as to why you are building one and what you want this group of people to accomplish as a unit. The more important your issue is to that community, the more it will take on a life of itself, and the manager’s job will ultimately become that of an administrator; maintaining the peace among members. Community Leaders can eventually do most of the work while Community Managers can watch the community take on a life of its own. “Critical mass is key,” Justin reiterated throughout his presentation. “You want to make sure the service has enough critical mass to survive,” and as soon as that tipping point is reached you will understand the true value of having your own online community. This event was part of NWCU, community-powered learning driven entirely by member participation. NWCU is a curated collection of classes, workshops, Meetup groups, and hackathons, all sharing one core common goal: help existing and aspiring independents build, learn, and share with one another, so more people can lead better, happier lives working for themselves. New Work City is a coworking space and community center for independents in Manhattan. We gather in a cozy shared environment to work, collaborate, learn, and socialize. All you need is some work to do and a friendly disposition! View Larger MapPosted by Sam Frank, who manages the New York Division of UnRated Magazine and works as an Assistant Project Manager/Web Producer at Arrow Root Media. WordPress 3.1 Book Giveaway – Free!